Breastfeeding, according to all the trendiest news stories, is the best thing ever — it turns your baby into a super genius with a brain the size of a mutated cantaloupe and all but ensures that child's eventual acceptance into an elite university, either Oxford or the Sorbonne, but maybe Harvard as a back-up. There are drawbacks, of course, but there are drawbacks to eating too much ice cream and nobody's solution to brain freeze is, "Stop all intake of ice cream." The point is, if you're a truly dedicated mother, you'll breastfeed, and if you refuse, the city of New York under Caius Brutus Bloomberg will make it unreasonably difficult for you to procure formula. 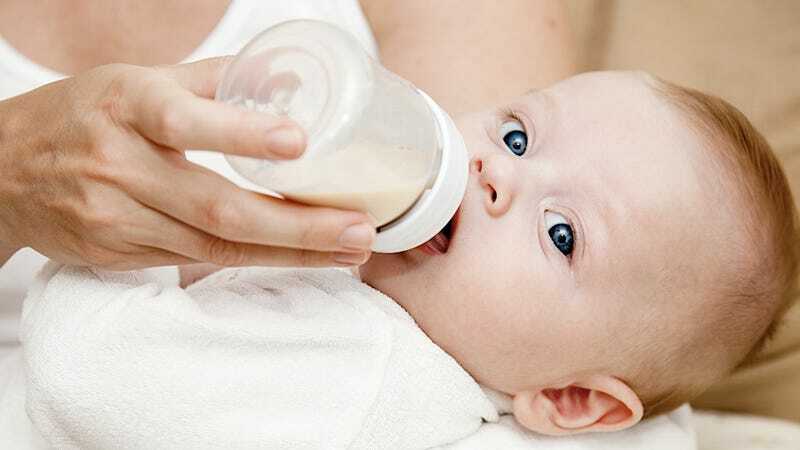 Starting September 3, reports the Post with nary a tinge of salaciousness, New York will implement "the most restrictive pro-milk program in the nation." As part of the city Health Department's voluntary Latch On NYC Initiative (which, I think we can agree, is a terrible name), New York's 40 hospitals will give up "swag bags" featuring formula logos (which include branded mugs and bottles), as well as document a medical reason for every bottle of formula that a newborn receives. Back in April, the consumer advocacy group Public Citizen wagged its finger at hospitals for being complicit in unethical marketing of the formula products, and so called for healthcare facilities to "immediately discontinue the distribution of commercial infant formula manufacturer discharge bags." Though New York's latest move to restrict the wanton distribution of formula grab-bags to labor-weary mothers has been applauded by breastfeeding advocates, formula-feeding moms are rightly pissed that they're getting a heavy-handed lecture on how best to fill their infant's squishy little body with nutrients. The key to getting more moms to breast-feed is making the formula less accessible. This way, the RN has to sign out the formula like any other medication. The nurse's aide can't just go grab another bottle. Latch On NYC is extremely susceptible to criticism as a restriction on personal freedom, but the idea that formula makers aren't also exerting a similar (if subtler) kind of pressure on new mothers to use formula is naive. Still, nobody likes a lecture and being told that there's only one correct way to care for her newborn is probably the easiest way to anger a mom. "They make formula for a reason," says Roxanne Schmidt, "and the FDA makes sure it's safe." Putting that kind of trust in the FDA might be little too precarious a leap of faith for some people, but Schmidt does have a point — suddenly restricting a mother's choices is the most patronizing way to effect change there is. Besides, it's self-defeating — think of all the times someone reminded you to recycle or quit smoking or not huff so much glue, and then ask yourself if that person's nagging made you really want to change your behavior or, instead, exacerbated it, just to make them understand how paltry few fucks you gave about their attempt to regulate your behavior.